Salt Lake City - For months now, deer hunters have wondered how many general buck deer permits will be available for Utah's 30 new deer hunting units this fall. The 86,500 permits the board approved are 500 fewer than the 87,000 permits available in 2011. Anis Aoude, big game coordinator for the Division of Wildlife Resources, says the number of permits dropped slightly because some of the 30 units will be managed for a higher buck-to-doe ratio than biologists have managed them for in the past. "The best way to increase the number of bucks per 100 does is to reduce the number of bucks that are taken during the hunting season," Aoude says. Starting this year, biologists will manage 14 of Utah's 30 general deer hunting units for 15 to 17 bucks per 100 does. The remaining 16 units will be managed for 18 to 20 bucks per 100 does. Aoude says the 14 units that will be managed for a lower buck-to-doe ratio are units that provide good access to lots of public land. "Units that are mostly private land, or units that have public land that's difficult to access," he says, "are the units that we'll manage for 18 to 20 bucks per 100 does." In addition to approving general buck deer hunting permits at their May 3 meeting, members of the board also approved permits for Utah's remaining big game animals. With the exception of Utah's general bull elk hunt, applications for all of the state's hunts that involve male animals were accepted in February. Results of the 2012 big game draw will be available by May 31. You can apply for a doe deer, cow elk or doe pronghorn permit starting June 1. 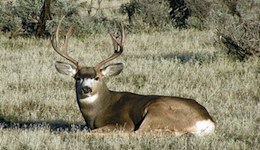 Results of the 2012 antlerless draw will be available by July 11. Permits to hunt during the state's general bull elk hunt will be available on a first-come, first-served basis starting July 17. Hunters have already applied for general buck deer hunting permits. If any general archery or muzzleloader buck deer permits are available after this year's big game draw, the permits will be available—on a first-come, first-served basis-starting July 19. Any general buck deer rifle permits that are still available after the draw will go on sale-on a first-come, first-served basis-starting July 31. If the general archery season ends-but all the archery permits haven't been sold-the archery permits will be converted to muzzleloader permits. These muzzleloader permits would be available-on a first-come, first-served basis-starting Sept. 17. Any muzzleloader permits that are still available after the muzzleloader hunt ends would be converted to general rifle permits. These rifle permits would be available-on a first-come, first-served basis-starting Oct. 9.